The first stage of the digital transformation of diplomacy has been an astonishing success. For a profession with an inbuilt propensity for cultivating tradition, defending institutional hierarchy, and resisting change, the rise of digital diplomacy has been nothing short of a revolution. Within less than a decade since the launch of the first social media networks, 90 percent of all UN member states have established a Twitter presence, and 88 percent have opened a Facebook account with a combined audience of 325 million and 255 million respectively of followers, likes and users. A growing number of Western embassies are also operating on Chinese social media platforms and some of them are using these digital tools with great success. Driven by the opportunity to engage with millions of people, in real time, and at minimal costs, foreign ministries, embassies and diplomats have developed a constellation of new tools and methods in support of their activities. They range from the use of dedicated platforms for engaging with diaspora communities and foreign publics, communication with nationals in times of international crises, to the development of consular applications for smartphones. As we are now about to enter a more sophisticated phase of the Digital Age, it is important to ask ourselves how the emerging digital technologies may shape the next stage of digital diplomacy. Mixed Reality technology (MR), which blends real and virtual worlds, is, for instance, one area that has been developing at a fast pace with the promise to transform how industry operates in various sectors. What MR may add to digital diplomacy is the possibility for audiences not only to read or visualize messages communicated by foreign ministries and embassies, but also to virtually experience their public engagement and outreach activities. A well-designed and exciting immersive experience of the opening ceremony of the Winter Olympics to take place in Beijing in 2022 could have, for instance, significant soft power implications. Augmented reality systems (AR) could also prove useful for creating highly interactive public diplomacy campaigns or for tailoring consular services to individual needs, possibly in combination with iBeacon technology. Benefiting from strong demand for geospatial data and imagery, paired with the reduction of costs for building, launching and maintaining constellations of satellites, satellite remote sensing (SRS) is another technology that promises to push the boundaries of how diplomacy operates in the digital age. Data mined from satellite images could be particularly useful, for instance, to foreign ministries for managing natural or human-made disasters in real time. Satellite technology was, for instance, a key instrument used by the World Health Organization (WHO) and Western diplomats to assist in the management of the 2014 Ebola crisis in West Africa. The satellite images made available by the International Charter for Space and Major Disasters, an international agreement between space agencies to provide free satellite images in the immediate aftermath of natural or human-made disasters, helped international teams characterize where and how to deploy overseas medical staff and their support bases. 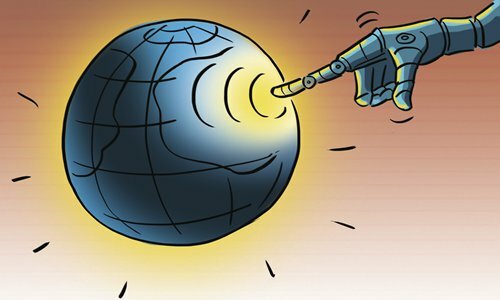 Artificial Intelligence (AI), which refers to the concept of machines being able to carry out tasks without constant input and monitoring from humans, is another breakthrough technology with potentially significant impact for the practice of diplomacy. The fourth Industrial Revolution is actually premised on the very idea of AI disrupting the velocity, scope, and systems impact of the technological transformation of the global economy. While the possibility of creating a robo-diplomat in the near future is quite limited, artificial intelligence has nevertheless made steady progress in consular affairs. At the lower end of the complexity scale, chat-bots now assist with visa applications, legal aid for refugees and consular registrations. Sophisticated algorithms are also being developed by foreign ministries to advance the spread of positive narratives and inhibit online disinformation. One would also expect AI powered analytics to soon become an indispensable tool for embassies by helping them better tailor and fine-tune their bilateral or multilateral diplomatic approach. Predictive analysis using big data may offer a comprehensive, in-depth and real-time understanding of the local conditions in which embassies operate. It is arguably too early to pass judgment on the success of the second wave of digital diplomatic disruption, as the balance between the drivers and counter-drivers of Digital Diplomacy 2.0 remains fragile. Cooperative endeavors supported by interconnected tech ecosystems and strong demand for digital services will create a conducive environment for further digital transformation, while confidence-eroding strategies such as disinformation and propaganda will likely push the needle in the opposite direction. The intriguing question that we need to ask is what will diplomacy look like if the second stage of the digital transformation is successful.